Anthony Bourdain has eaten his way through much of the world. The curmudgeonly New Yorker has been many places, and shared myriad insights on diverse subjects such as dictatorships and pork along the way. But when it comes to deciding on filming locations for his CNN show, Parts Unknown, Bourdain revealed that he isn't beholden to the network. In a new interview with Travel + Leisure, Bourdain said he's basically able to spin a globe, plot his next move, and take the CNN crew along for the ride. Bourdain told the magazine that despite his reputation as a chef and noted opinion-haver about food, the program doesn't have to focus extensively on local cuisine. Instead, Parts Unknown shoots in "places that I’ve always wanted to go and haven’t been able to go or places where I’d like to look at it from a completely different perspective,” he said. To that effect, the show's season 11 premiere on Sunday will take viewers to West Virginia and immerse them in a culture at "the heart of god, guns, Trump and football,” according to Bourdain. This, as any regular viewer of the show can tell you, is a world away from an exotic snorkeling adventure in Sicily or driving through the Congo's rugged landscape. Per CNN, we learn that West Virginia offers the host a few surprises, as the network writes in a press release: "Bourdain’s own preconceptions are dashed as he finds the West Virginian attitude to be a remarkable dichotomy, both resolute and open-minded." He also plows his way through an array of local delicacies, such as "snapping turtle patties, squirrel gravy, pawpaw ice cream, spaghetti pie, and bear meat." 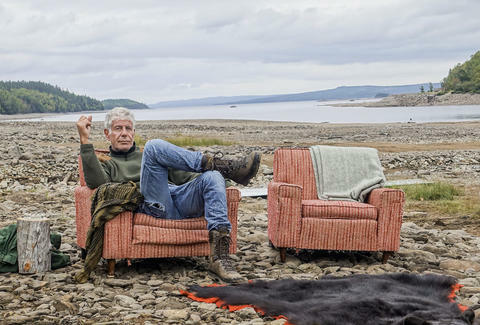 Season 11 of Parts Unknown also follows Bourdain through Newfoundland, Uruguay, Armenia, Bhutan, Berlin, US Cajun country, and Hong Kong. Where he goes after that is anyone's guess, but it'll undoubtedly be interesting. Check out the full interview with Bourdain over at Travel + Leisure.